I live in Paris, and one could think that such a big Metropole is only made up of lifeless buildings. But the many parks and squares in the city as well as greened balconies and windowsills, let a lot of wildlife develop itself peacefully. If it weren’t for the rats, but that was a different post. Last Sunday, we went on a very nice birthday outing, to re-explore what must be my favourite place in the city of love, the Palais Royal and surrounding area (that means eating Japanese in the neighbourhood). It was shockingly quiet, the streets were void of tourists and people having lunch in the area. On our chemin towards the Carré Louvois, a little square(that’s the word carré) surrounded by beautiful buildings harbouring a big fountain and most importantly a playground, I received a call from my father in law, wishing me a happy birthday. 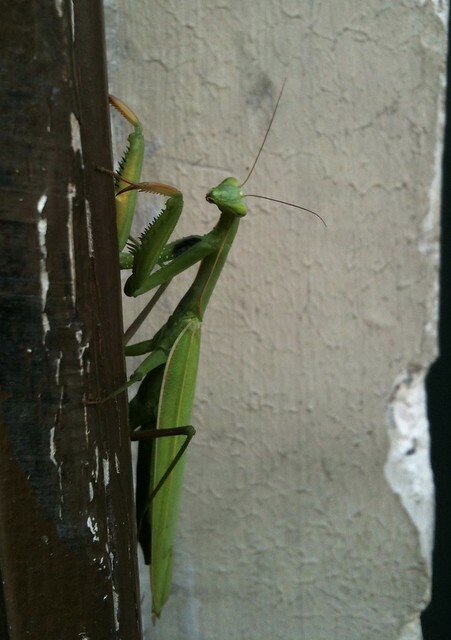 But suddenly my concentration was elsewhere as my eyes fell onto a praying mantis sitting peacefully in the Rue Louvois. 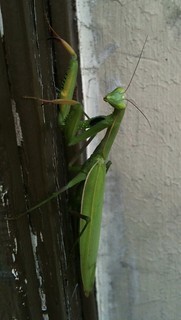 In the past, I have seen a praying mantis once or twice, but always in a more natural setting. 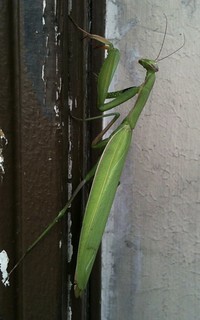 I recall my mom being all excited about her rare sightings of a mantis. 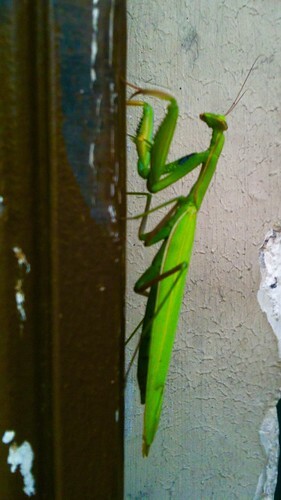 So this enormous, beautiful and majestic insect made me think of my mom. Maybe she sent the mantis as a birthday message? This little or big critter made me smile a lot. It seems to be such an exotic animal. In German, we call it a Gottesanbeterin, a woman praying God, in French, it’s a Mante Religieuse, a religious mantis, and according to the French Wikipedia mantis actually means “prophetess goddess”. I heard a little rustling of the leaves, as I had just before observed rats searching for food in treetops, I thought that was what I was going to see within the flowers arching over the path, but I found myself more surprised than anything else. A tiny, what am I saying, minuscule little bird took its flight. It looked black, but that might have been due to the dark shadow surrounding it. Smaller than the palm of my hand, I could spot a rather long and thin beak. I got all excited, you can imagine, and my perpetual smile grew even bigger. Hummingbirds are not in the slightest native to Europe. I checked the internet, but that didn’t give me any answers. I now know how to deal with a baby bird though… It’s not a Goldcrest, which is the smallest bird we are meant to have in Europe. Maybe someone’s pet escaped? Since my tender childhood, I have been drawn to bees. Maybe it’s the succulent honey they make or the recomforting buzzing that can be heard near a beehive. Whatever the reason, bees do make me happy, they lift my spirits. Lately, I don’t mind doing the dishes (I really don’t like doing the dishes, but it has to be done), as I have a front row standing place to observe bees collecting nectar and pollen. Just outside our kitchen window, on the windowsill, there is a flower box in which we have a few plants, predominantly mint because mint multiplies very quickly. We don’t actually use the mint, but we let it be for the bees. For months, the mint has been flowering, so every day I can observe a bee harvesting this melliferous flower. Yesterday, there were four European dark bees busy working outside my kitchen window. Mint might not be as pretty as geraniums, but the bees love it! Wouldn’t you love to taste the eclectic mix that urban honey must be? Sounds like a great birthday venture into the wilds of the city. It is cool to see wildlife where it isn’t really expected. Can’t help you with the bird. Somebody around mus have fresh, local honey…. 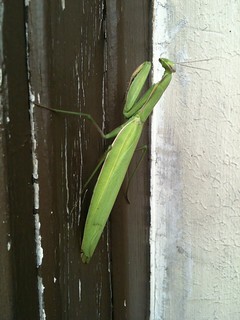 Hi Solveig, how cool to see praying mantis in the most unexpected places. And belated Happy Birthday. Hope all is well with you and your family. And I am completely envious that you live in a city where there are so many amazing places to go. I think I would trade seeing the hummingbirds in our garden for experiences like that. Although I really have nothing to complain about, when we live 3 hours from Los Angeles (not my favorite city) and 2 hours from San Francisco. So good to “see” you!!!!!! I have been remiss in my blogging duties – don’t really know why – I guess still really focused on my weight-loss journey. Promise I will come visit more!!! It’s amazing how much wildlife finds a new niche in the metropolis. Lovely picture! You wouldn’t think you’d find so much wildlife in a city!! Great post!